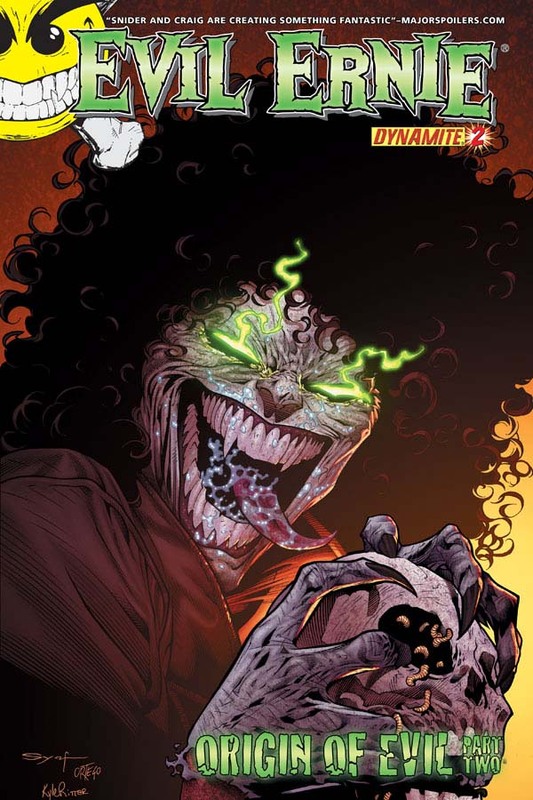 The Fellowship was fortunate enough to obtain a copy of EVIL ERNIE #2 from Dynamite Entertainment. The story is by Jesse Blaze Snider with art by Jason Craig, and colors by Marcio Menyz and Adriano Augusto. Ernie has been reborn into a powerful creature after his electrocution. He starts eliminating all the sinners around him on the way to his true objective – Buford King. Knowing this, Buford uses Ernie’s psychiatrist as a shield. The smiley button, Ernie’s confidant in life, continues that duty in his new form, but has taken a demonic appearance. Somehow, it also seems to know about Ernie’s powers and his purpose. Ernie catches up with Buford, but he was ready and waiting for him. At the worst possible point, Ernie’s powers fade. And what is happening to the priest? This has been an interesting start to a series so far. I love Smiley’s humor! I’m curious to find out more about what it knows. I have never read the series produced by Chaos Comics, so I don’t how far the reboot strays from the original with the exception of no reference to the character Lady Death. Jason Craig’s art is incredible, definitely like what I have seen so far. I am curious to see where this series goes. It’s been good so far. EVIL ERNIE #2 is in stores now and available at www.dynamite.net.